Border between Serbia and Bulgaria. We drove south from Beograd towards Nis on a good 4 lane motorway (toll road), E-75. Just outside of Nis, we forked onto E-80 (direction Sofia in Bulgaria) and continued on this good road towards Pirot. However, before the Hwy. bends south to Pirot, locate a signed road going left to Temska. In Temska, keep left and continue to Kalna. Alternatively, one can arrive in Kalna from Knjazevac, ie. from the opposite direction. Turn right in Kalna to Balta Berilovac, stick to the largest road with various signs for the ski area and or mountains. This road climbs up through a valley and up towards a main ridge. 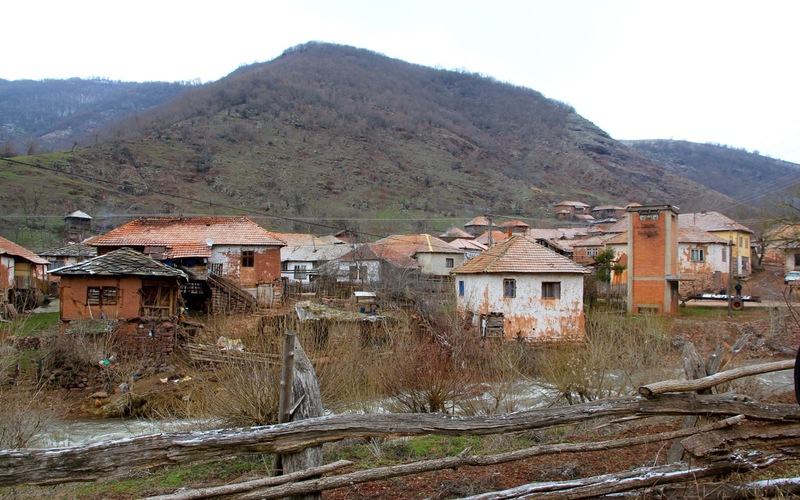 As the road climbs to about 1400 meter of elevation, you reach a flat area where a side road goes left, signed for Hotel Babin Zub. 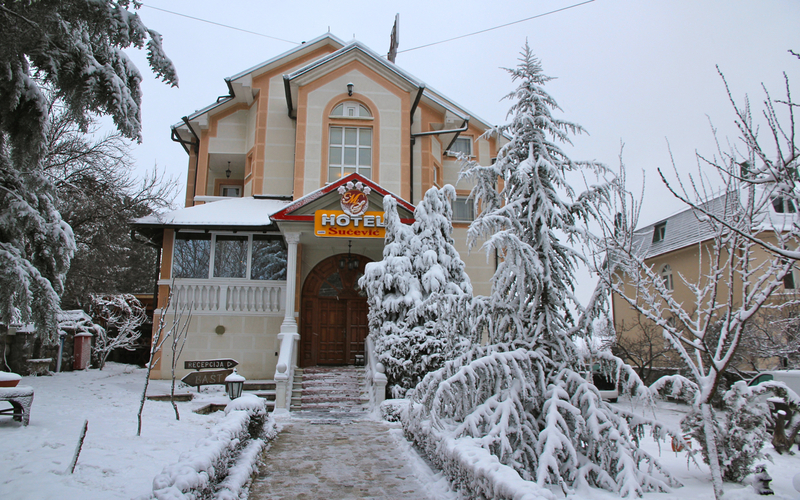 If you proceed straight, you will find a large, modern 4 star hotel (skiing and spa) called Hotel Stara Planina. To get to the trailhead, turn left and drive to hotel Babin Zub. Park there, this is the trailhead, location N43.37471, E022.61643, elevation about 1575 meter. From the small parking area, follow the path (small road in summer?) that is used to access the skiing area. This will quickly lead to a ski lift. Continue a bit left as you follow the main ridge to its col at location N43.37521, E022.62496, elevation just below 1550 meter. From here, continue to ascend the broad ridge, there are tracks from an old road, however this is difficult to follow in winter. Higher up, there is a local bump on the ridge, the route goes around this on the left side. Just before this short traverse, there is a sign saying Midzhur 5 kilometer. Beyond this bumb, the terrain is quite level, the route now runs more right and continues up the hill in a long traverse, this time with higher terrain on the left side. 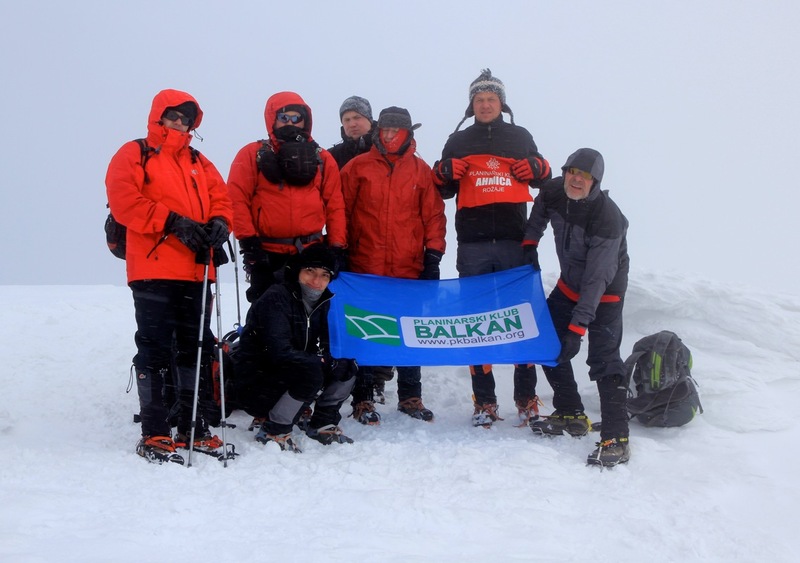 One can follow a fairly straight line that will connect with the main crest, ie with the Serbian-Bulgarian border about 700 meter before the summit. We hit the crest (in white-out conditions) at location N43.39970, E022.67037, elevation 2118 meter. Finally, follow the broad and level ridge to its highest point. 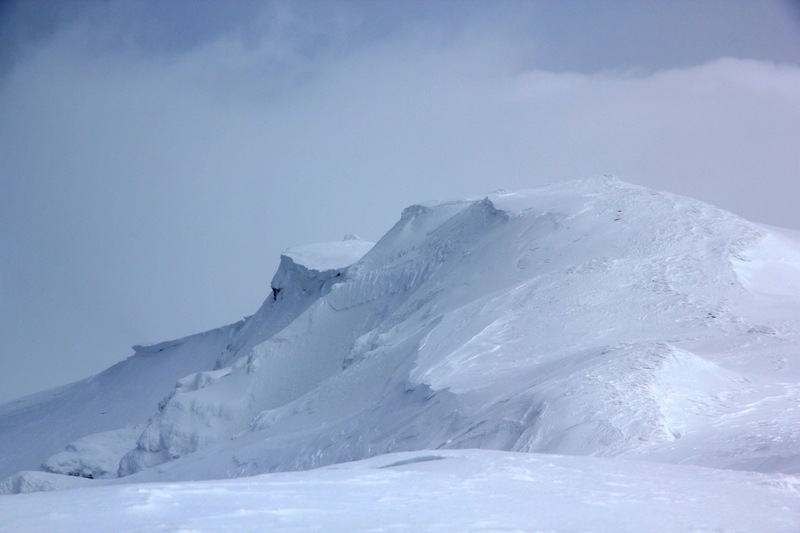 Be aware that the Bulgarian side forms a long vertical cliff with overhanging cornices in winter - keep a safe distance! I climbed this mountain with Atle Loneland. We arrived pretty late in Beograd (on March 14. )and it took us some additional time to locate our hotel near E-75 on the south side of town. The next day, we drove on an excellent (E-75, toll) motorway south to Nis, then more east via Bela Palanka to the village of Temska. A quick look at the map showed a road via Topli Do connecting to the north, providing access to our intended trailhead. Big mistake! We drove to Topli Do on a road that had quite bad dammage with several creeks running across it etc. Beyond Topli Do, the road quickly became a 4WD road and we turned around near a small farm, the farmer explaining with arm movements that the snow higher up would be meter deep. The correct approach is to go via Temska across north to Kalna, then along a pretty good mountain road that now serves the ski area from where one can start the climb. 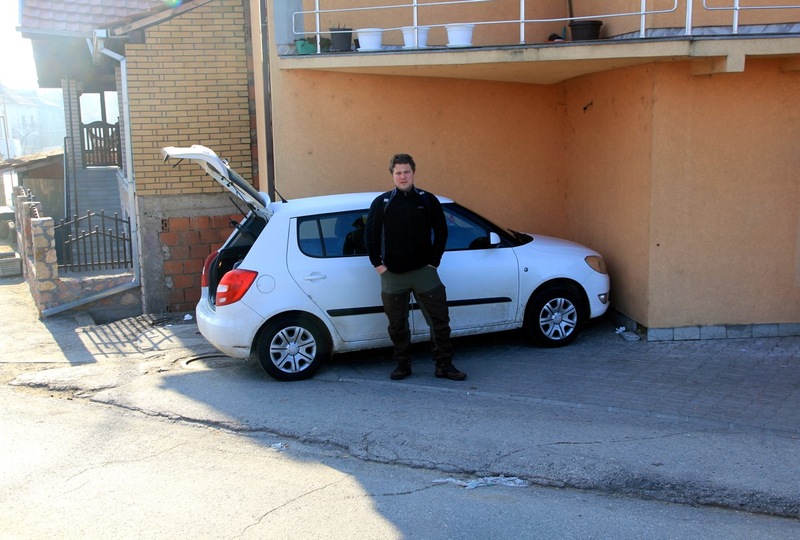 We booked a room at Stara Planina (Babin Zub was full), then set out to explore the conditions/trail. The weather was all fog and as we got higher, the wind increased to full storm strength. We got a late start and with pretty slow progress I soon realized that we needed to turn back. What had been determined was that the snow conditions were ok, crust and wind blown surface, no deep snow except across the very first connecting saddle in the ski area. Thus, after hiking to about 1700 meter, we turned around at 1500 and were back at the car around 1530. We had a good stay at the fancy ski hotel, all inclusive for about 50 Euro per person. After breakfast at 0700, we checked out, drove back to Babin Zub, and then started out at 0830. It was much less windy today, but unfortunately, the fog was as dense as yesterday. We proceeded uphill beyond our turn around point from the day before. Staying on the ridge, we failed to see the sign that shows how to bypass the local hump. Thus, we climbed it head on and soon realized that we had arrived at a local top. It was moderately steep down, but impossible to see if there could be steeper terrain below. A very unwelcome situation as the fog forces utmost care. With unknown terrain below, the crust was hard enough that a slide could be bad. We consulted Atle´s phone (Google map) and observed that the old summer road where further left. Thus, I ascended a bit and traversed in that direction. As we descended towards the summer path, we ran into a party of 8 Serbs that came along the correct route. 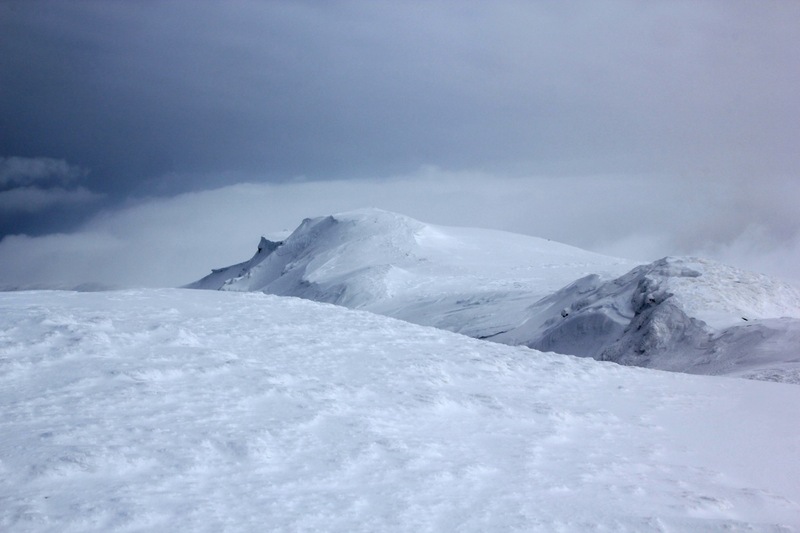 They where using crampons and carried ice axes as well as walking poles. The short traverse was not hard without crampons, but since I carried mine, I decided to put them on. We had unfortunately, left our ice axe in the car, believing that this route would not require such a tool. However, without crampons the terrain was steep enough that an ice axe would be nice to have in order to completely rule out any accidental slide. 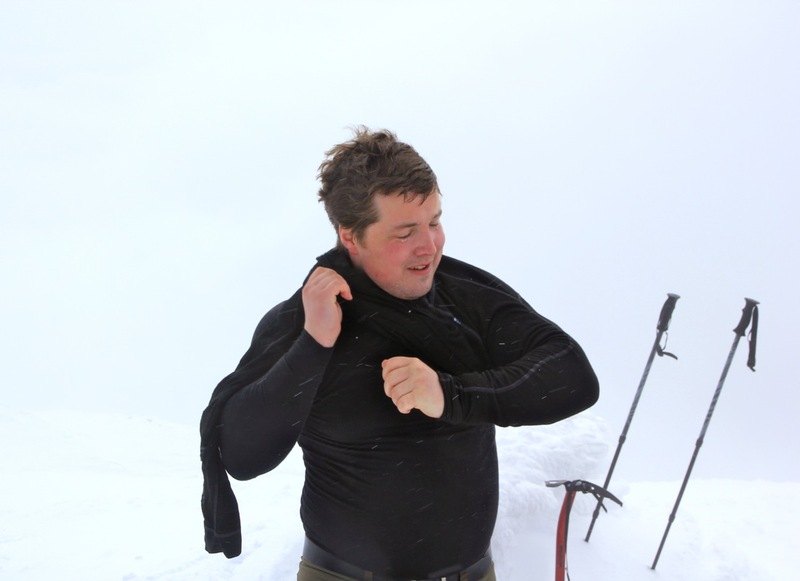 Thus, Atle borrowed an axe from one of the Serbs that walked on crampons. The good news was that we were now well equipped to continue the hike. 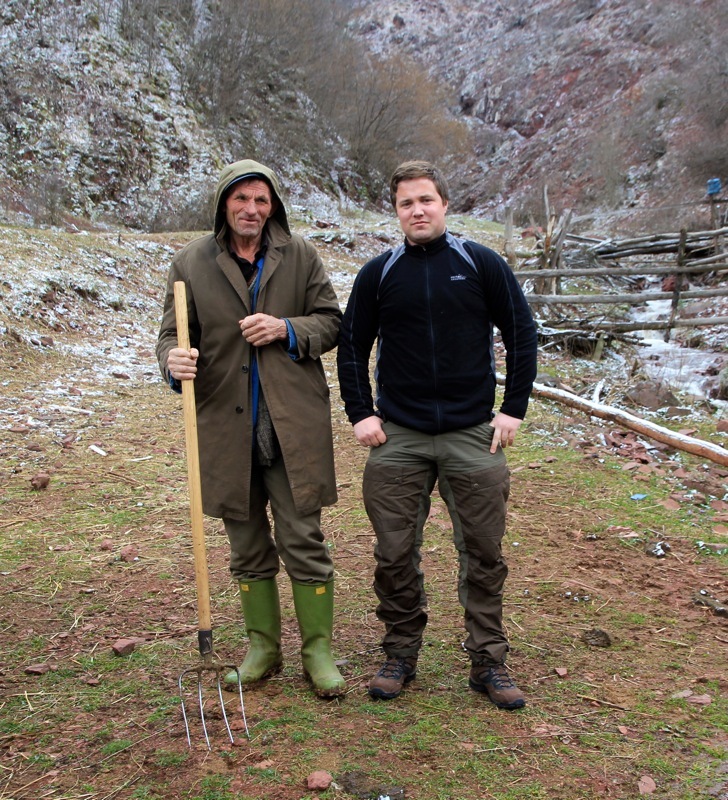 The bad news was that the Serb party walked extremely slowly and we had to stay with them having borrowed an axe. Initially, the Serb party regarded us as ill equipped and clearly inexperienced, since we came down from the bump - totally off-route. This should soon change, they walked on a long line ahead in the fog, then gradually turned 180 degrees on the fairly flat area beyond the hump. I pointed out that they were now heading back home and took the lead with my GPS bearing set for the summit. After what seemed like a very long walk with nothing but fog, I finally arrived at the main crest and waited for everybody to assemble. We had 700 meter with about 50 meter of ascent to go. The Serbs were all very happy, several pointed out how important my GPS unit turned out to be. 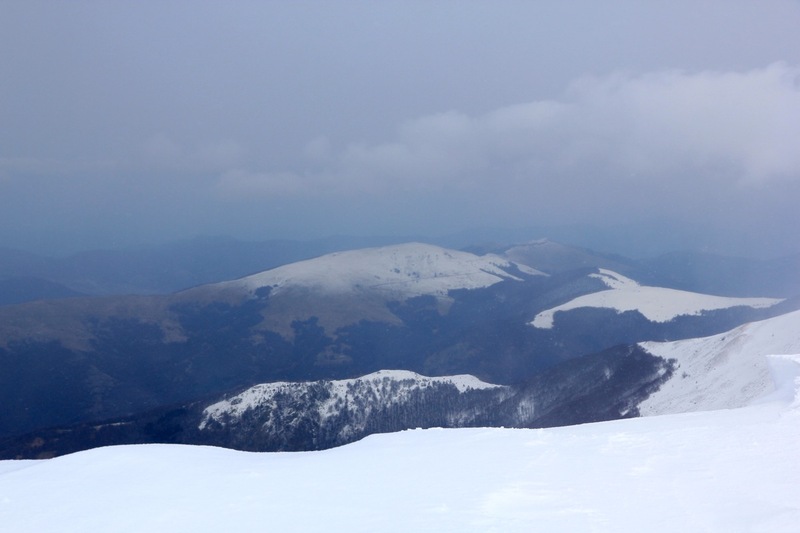 It turned out that the clouds were heavily pushed towards the slopes on the Serbian side, while there were no such clouds in Bulgaria. Thus, we had some view in that direction and the top of the ridge itself had intermittent clear view. The steep cliffs on the Bulgarian side added to the local scenery. We arrived at the summit cairn by 1250 and took a well deserved half hour break for photo and some warm drink. Heading back down, the Serbs believed they could follow our tracks, but they were close to all gone. It again took some time before they understood that I could lead the way back by following the tracks on my GPS unit. The going was slow, in fact we took almost as long to walk back down as it had taken us to ascend. Finally, we traversed around the small hump and came back to the trail sign pointing for Midzhur. 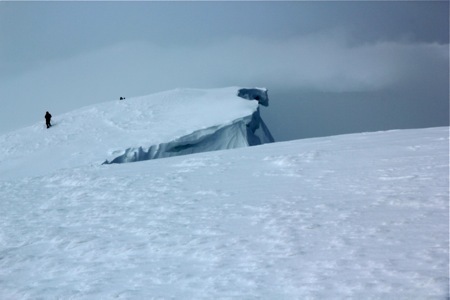 We thanked the group for Atle´s use of an ice axe and waved goodbye, then back to the car at Babin Zub, arriving at 1645. The trip had taken a full 8:15. Our trip continued to the Knjazevac village where we got a room, and a full 3 course dinner including 2 litres of beer for 35 euro. The place had 400 guest celebrating a wedding until 0200 when they music ended and the house got quiet. The next day, we had a good climb of Siljak. 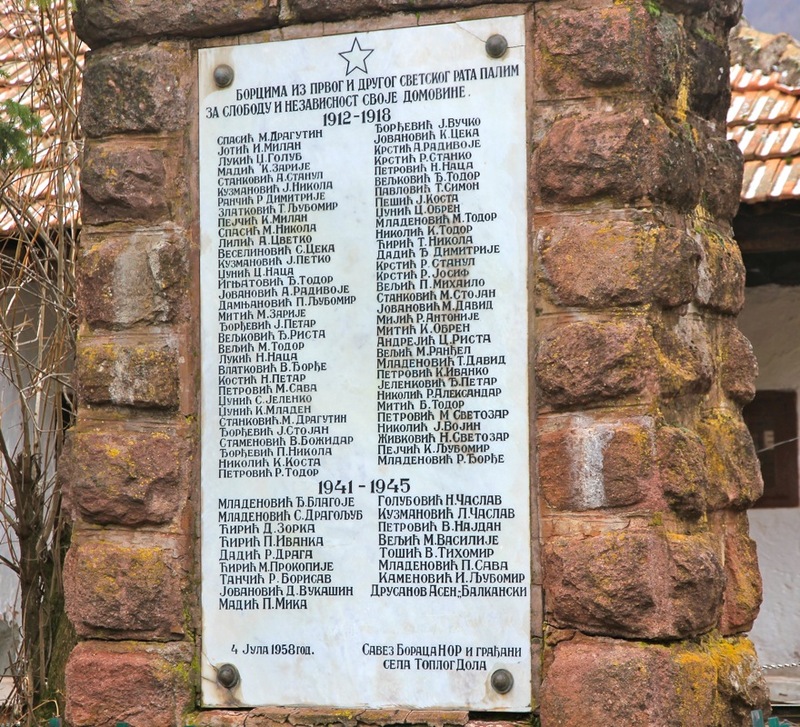 War memorial in Topli Do. The main crest, continued to the south-east.